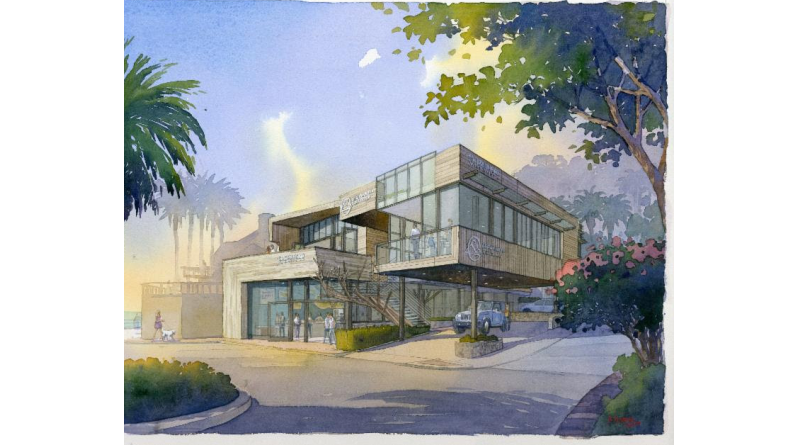 An artist’s rendering of the Catalina Island Conservancy’s new visitors’ center, The Trailhead. AVALON — The Catalina Island Conservancy celebrated another major milestone in its long-range strategic vision and master plan, Imagine Catalina, with a groundbreaking ceremony for its new visitors’ center, The Trailhead. A crowd of supporters – including Avalon leaders and the Conservancy’s Board of Directors – attended the event in July at the site of the new center on Crescent Avenue. The 9,000-square-foot three-story building will feature educational exhibits and programs to provide guests with insights into the Conservancy’s mission and work and the Island’s natural history, ecology and geology. The Trailhead will be Avalon’s first LEED-certified building. The Conservancy also proposed the installation of a local desalination unit to convert saltwater to drinkable water and will be seeking the necessary approvals for it. The anticipated opening date for The Trailhead is the summer of 2018. The Conservancy is also slated to celebrate the launch of Imagine Catalina’s next major project in October 2016: Trekking Catalina – A Master Trails Plan, which will create a world-class hiking experience. It will be the biggest addition to the Island’s trail system since the opening of the 37.2-mile Trans-Catalina Trail in 2009, according to the Conservancy. Multi-purpose meeting spaces will be available for Conservancy events, community activities, corporate meetings and weddings. The Trailhead also will feature a mission-related retail space and a café.